ATLAS is on the move again! We have three awesome trips lined up and have plenty of room for more students. This summer we’ll be heading to Peru for a service-learning trip where we’ll learn about art and culture. In December, we’ll travel to Dublin, London, and Paris where we’ll learn about the development of Western Europe’s finest capitals. The next stop will be Athens, Florence, and Rome where we’ll explore the architectural breakthroughs of the Renaissance. 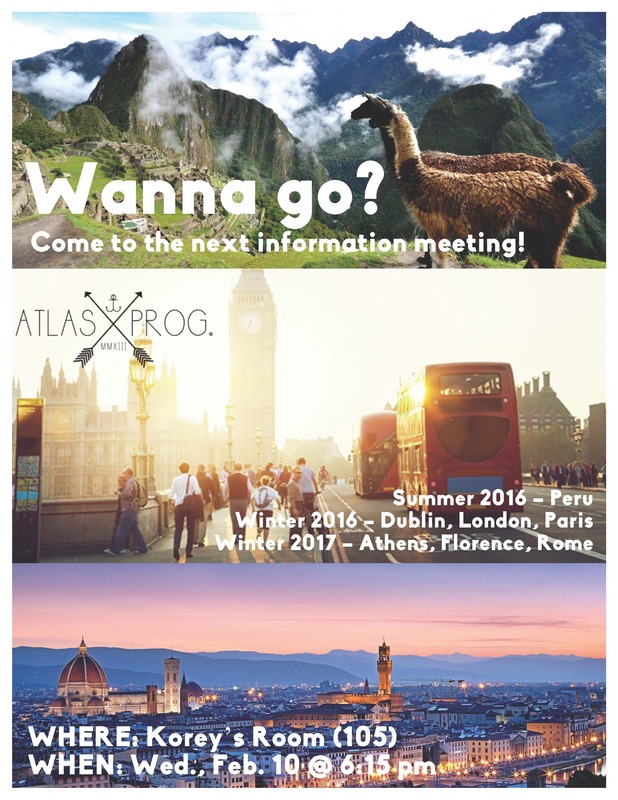 If you’d like to learn more about these trips and reserve your first-come, first-serve spot, join us at our next information meeting! Designers, Week 21 leads up to some big events. 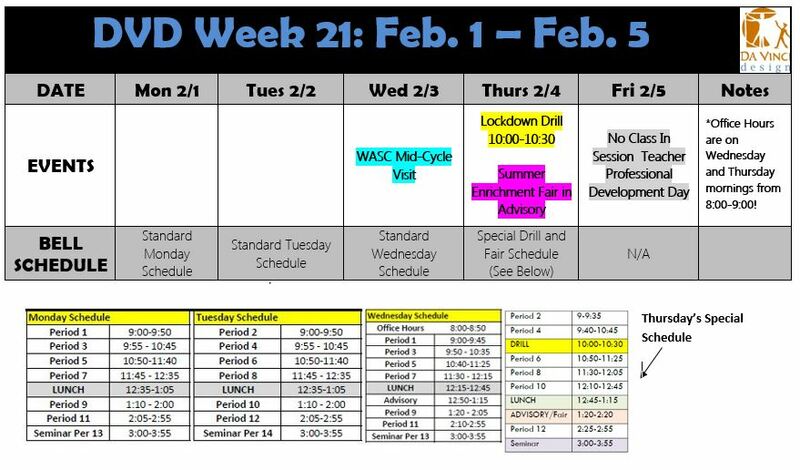 We have our school-wide Lockdown Drill and the Summer Enrichment Fair on Thursday 2/4. We also have a lot of sporting events that you can attend to support the DV Wolves! See schedule below. 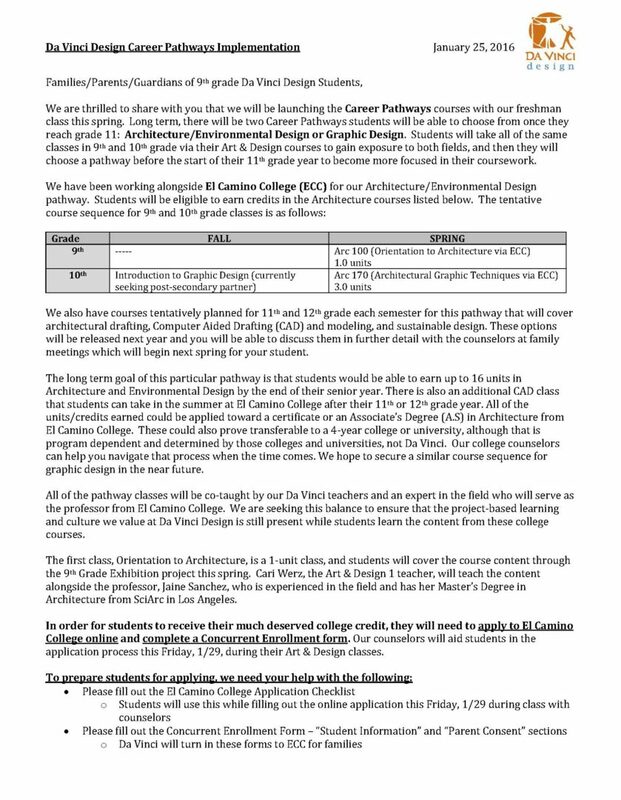 We are asking that parents/guardians help students fill out the concurrent enrollment form and questionnaire so that they can apply online for El Camino College alongside a counselor on Friday during their Art & Design class. Senior projects will be kicking off after Spring Break, and the senior team wanted to inform you of upcoming dates, deadlines, and requirements to participate in the projects. 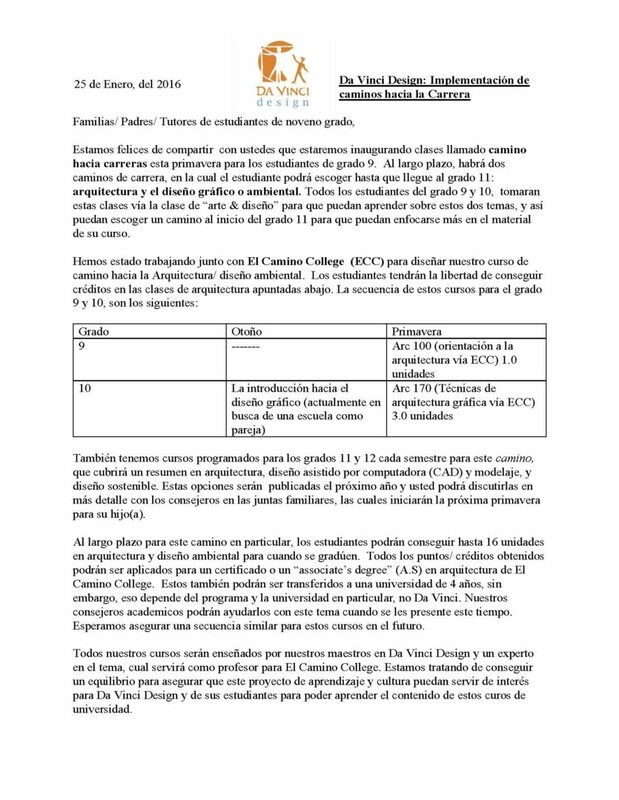 Senior projects are an assignment that students plan and implement themselves and this results in a different schedule for seniors during this time period. We welcome and encourage you all to attend the parent info. night which is going to be held next Tuesday Feb. 2nd at 5:30 pm in Stoll’s room 403. There will also be a question and answer period during this meeting. 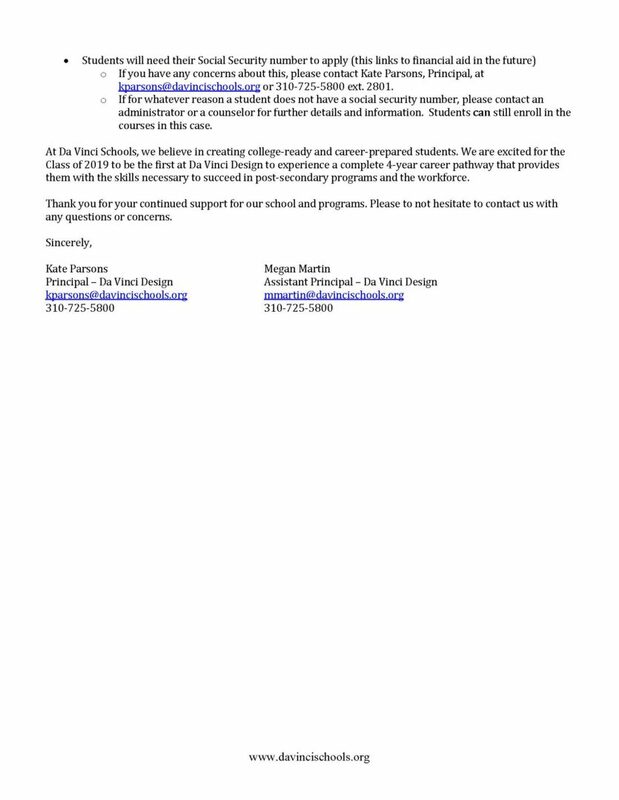 Your student was given a “proposal packet” with a parent letter that should be returned by Feb. 19th. FAFSA Workshop Night, tomorrow Jan. 27, 5:30pm-7pm in 10th grade art teacher Patrick’s computer lab Room 208. Computers are limited, so get there on time! 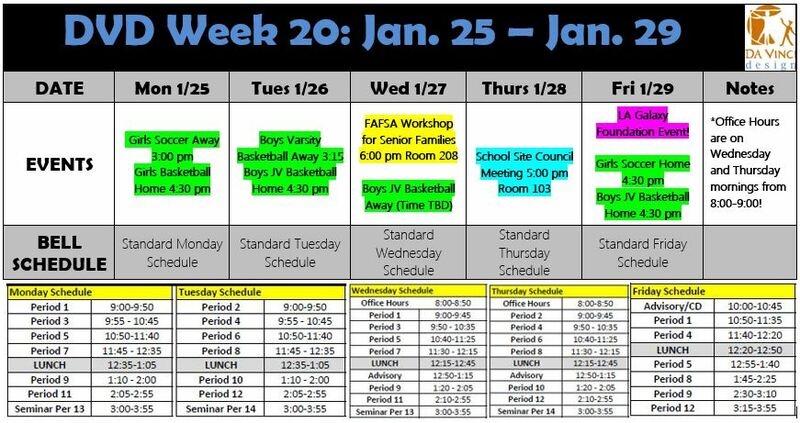 Don’t worry, there is another FAFSA workshop on Wed. Feb. 24 if you can’t make it tomorrow. 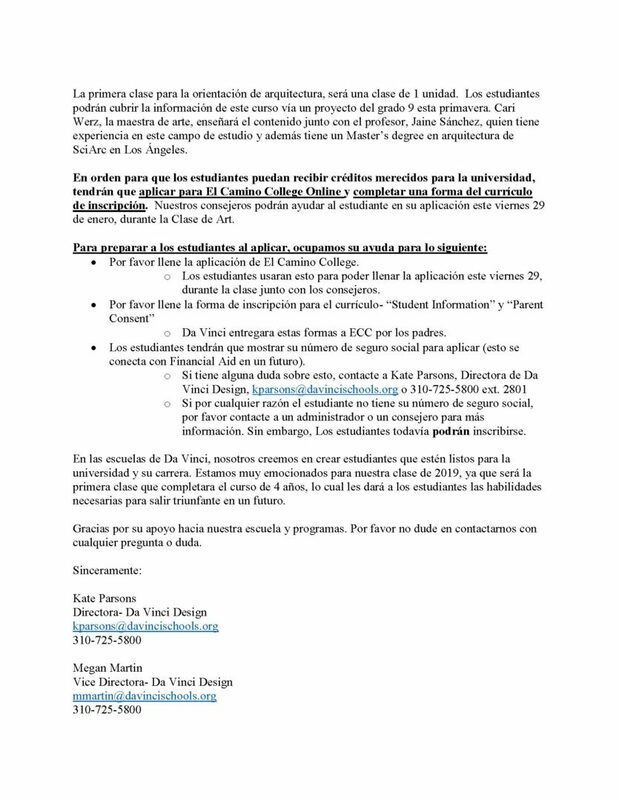 Cal Grant forms are due back to your counselor by this Friday Jan. 29. They were handed out last week. If you lost your form, please print out one of the attachments. Hello Designers! 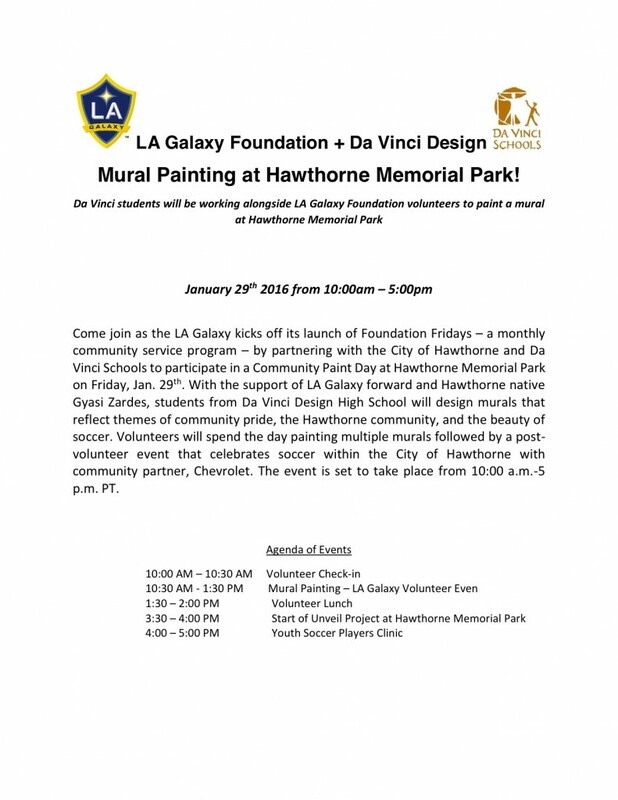 Week 20 brings the first of two FAFSA Workshops for Senior Families in Room 208 as well as an amazing collaborative event between the LA Galaxy Foundation and Da Vinci Design students (see previous post for details) at Hawthorne Memorial Park. We also have many sports games this week – come out and support your Wolves! Have a wonderful weekend. School Site Council Members – reminder about our meeting on Thursday at 5:00 pm! Please RSVP if you have not yet. Thank you! This is a final reminder that the second meeting for the SBI program will be held on the Communications campus on Saturday 1/23 starting at 9am. Please go to the back of the Design campus and enter through the Communications gates. There will not be anyone available to open the doors at Design. Tomorrow’s session should be exciting and engaging and will feature information that you won’t want to miss! Designers – Galileo summer camps is very interested in hiring Da Vinci students as their summer interns to help run the camp. The positions are paid ($10-$13 per hour) and run 6-8 weeks in the summer. 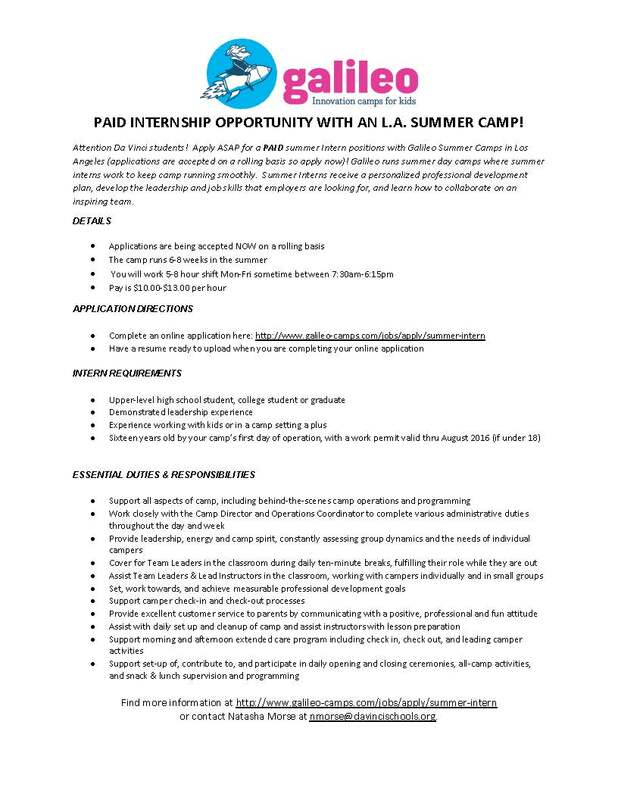 To apply, students should complete an online application here: http://www.galileo-camps.com/jobs/apply/summer-intern. Applications are accepted on a rolling basis, so the sooner students apply the better chance they will have of getting a position. More details are listed in the flyer below. on Saturday, January 23, 2016. The meeting will be held from 9am-1pm. Please see Ms. KGB if you need additional information!